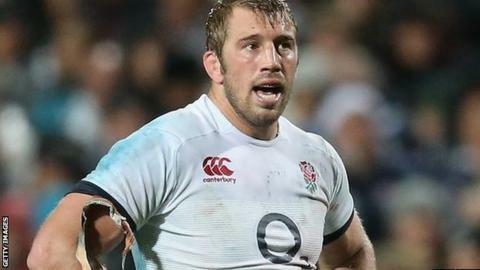 Harlequins flanker Chris Robshaw says he is "extremely privileged" to be reappointed England captain for the autumn internationals. The 28-year-old, who was first named skipper in 2012, will lead the side in Test matches against New Zealand, South Africa, Samoa and Australia. "It's always a huge honour," Robshaw told BBC Radio 5 live. "It's something you grab with both hands and something you are extremely privileged to be doing." Robshaw's appointment as England captain at the beginning of the 2012 Six Nations coincided with the beginning of Stuart Lancaster's reign as coach. He was relieved of the Quins captaincy in the summer, but stood in for the injured Joe Marler in Sunday's Champions Cup victory at Wasps. "It wouldn't be the same if I didn't have the great support around me," he added. "The character of the squad is second to none, and I'm really looking to meeting up with the guys and kicking on." On Sunday, Lancaster added nine players to his original party of 32 for the autumn series, which begins when world champions New Zealand visit Twickenham on 8 November. "It's extremely exciting," Robshaw said. "The guys can't wait. "The best teams in the world are coming to town, and that's who you want to play. They are the teams you want to play, they are easy to get up for. "But there is a lot of hard work to do before we play the first game."